The Cancer MoonShot 2020 program, a coalition led by biotechnology billionaire Dr. Patrick Soon-Shiong, is teaming up with 11 pediatric institutions focused on applying immunotherapy to treat childhood cancers. The partnership, called the Pediatrics Consortium, encourages the participating organizations to use molecular diagnostic testing, immunotherapies and clinic trials to treat cancer. Phoenix Children's Hospital will lead the initiative through its Chan Soon-Shiong Children's Precision Medicine Institute, which broke ground in October 2014 in partnership with Patrick Soon-Shiong. The Pediatrics Consortium coincides with the Cancer MoonShot's larger mission to standardize the use of immunotherapy and develop an effective vaccine-based immunotherapy to treat cancer by 2020. Soon-Shiong said he is banking on immunotherapy as a cure for cancer because evidence shows the immune system can both prevent the disease and fight it. As part of the partnership, the participating organizations will collaborate and share research under the Cancer MoonShot's “robust” database that allows information to be shared in real time, according to a news release. Soon-Shiong said that the Cancer MoonShot database aims to address the fragmented access to cancer research between various medical fields. Oncologist Dr. Peter Eisenberg at Marin General Hospital in Greenbrae, Calif., said although immunotherapy can be effective, the complexity of cancer requires more investment in basic cancer research instead of new therapies. He added that historically pediatric oncology has successfully used clinical trials and immunotherapies because most childhood cancer is treated at academic institutions with funds to invest in such novel therapies. Adult cancer treatment is usually done at centers where the physician does not have the time or funds to invest in advanced treatments or clinical trials. In response, Soon-Shiong said part of the Cancer MoonShot's vision is to standardize the use of clinical trials for adults as well, and invest in research. The Cancer MoonShot 2020 program does not have federal backing, despite claims on its website that federal entities are part of its National Immunotherapy Coalition, including the U.S. Food and Drug Administration and the National Cancer Institute. The FDA and NCI have both reportedly asked the program to remove its affiliation from its press releases. 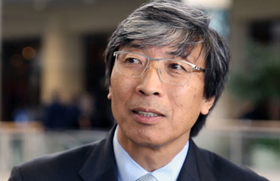 Soon-Shiong said the Cancer MoonShot is not federally funded, and phrasing on the site merely addresses the federal entities' support for the program's mission. Soon-Shiong said he and Vice President Joe Biden met to discuss their interlocking missions and are now pursuing them. President Barack Obama tasked Biden to find a cure for the disease after his son died from brain cancer in May 2015. Children's Hospital of Orange County, Orange, Calif.
Duke Department of Pediatrics at the Duke University School of Medicine, Durham, N.C.
Sanford Health, Sioux Falls, S.D.